Quilling, a craft that has been around for centuries, is a beautiful way to create a unique card for Mother's Day, or any special occasion. 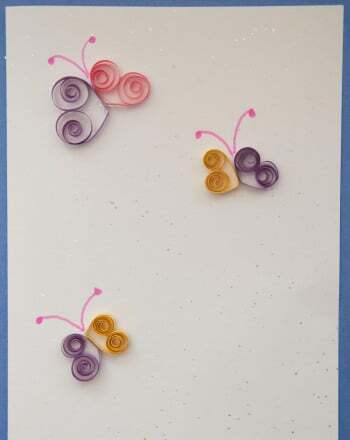 Quilling can be simple and elegant or highly detailed. Have your child fold a piece of construction paper in half to create the base of the card. Have her cut thin strips of construction paper in multiple colors. Fold each strip in half. Using a toothpick, she can carefully twirl half of a strip of paper around the toothpick until the paper is curled, or quilled. She can either glue it in place and wiggle it off the toothpick for a tight quill, or gently release it from the toothpick, and open the quilling up a bit and glue it in place for a more relaxed effect. Repeat this for all of the strips of paper, experimenting each time. Have her decide how she wants to apply the quills to the card and glue them in place. Have her write a special message on the front or the inside of the card and give it to someone she loves! Keep winter break boredom at bay with a printable deck of snowy playing cards! These printable cards give students the chance to practise using supporting evidence to identify an author’s claims. Spookify your storytelling time with some scary story cards! Use these vocabulary cards with the EL Support Lesson: Personal Timeline. Use these vocabulary cards with the EL Support Lesson: Division Skits. Use these vocabulary cards with the EL Support Lesson: Character Comparisons. Get into the spirit of the holiday season with these winter story starter cards! Use these word problem cards to give your students practise with division! Use these vocabulary cards with the EL Support Lesson: Characters and Settings.